The last time I remember a significant snowfall this early was on Halloween in 1993. We had taken our son Doug to an open house at Point Park College in downtown Pittsburgh. Around four, we stopped at Chili's for dinner on the way home; that's when the snow started. 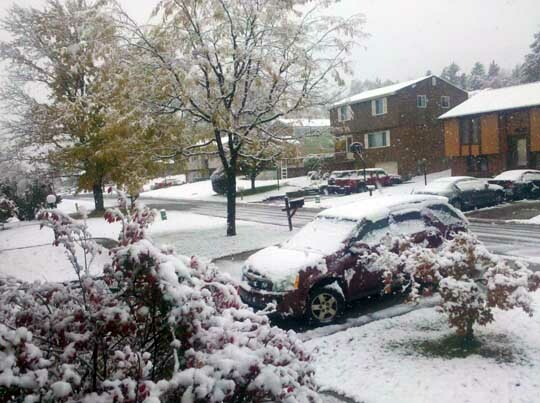 By the time trick or treat began two hours later, there were about four inches on snow on the ground. Temperatures will be warming into the upper 30s later, and the high tomorrow will be 50°, so all of this will soon disappear. Which gives me the unique opportunity to clear snow off my car and cut the grass all in the same weekend. I like Ron Paul. Really. Don't get me wrong- I'm not supporting Ron Paul for President. His inflexible interpretation of the Constitution would make the nation ungovernable. That said, there are provisions in our founding document that are inviolable. And on those points, there is no greater advocate than Dr. Paul. If you thought the "Transportation Security Administration" would limit itself to conducting unconstitutional searches at airports, think again. The agency intends to assert jurisdiction over our nation's highways, waterways, and railroads as well. TSA launched a new campaign of random checkpoints on Tennessee highways last week, complete with a sinister military-style acronym–VIP(E)R—as a name for the program. As with TSA's random searches at airports, these roadside searches are not based on any actual suspicion of criminal activity or any factual evidence of wrongdoing whatsoever by those detained. They are, in effect, completely random. So first we are told by the U.S. Supreme Court that American citizens have no Fourth Amendment protections at border crossings, even when standing on U.S. soil. Now TSA takes the next logical step and simply detains and searches U.S. citizens at wholly internal checkpoints. The slippery slope is here. When does it end? How many more infringements on our liberties, our property, and our basic human rights to travel freely will it take before people become fed up enough to demand respect from their government? When will we demand that the government heed obvious constitutional limitations, and stop treating ordinary Americans as criminal suspects in the absence of probable cause? The real tragedy occurs when Americans incrementally become accustomed to this treatment on the roads just as they have become accustomed to it in the airports. We already accept arriving at the airport two or more hours before a flight to get through security; will we soon have to build in an extra two or three hours into our road trips to allow for checkpoint traffic? Worse, some people are lulled into a false sense of security and are actually grateful for this added police presence! Should we really hail the expansion of the police state as an enhancement to safety? I submit that an attitude of acquiescence to TSA authority is thoroughly dangerous, un-American, and insulting to earlier freedom-loving generations who built this country. I am certain people will complain about this, once they have to sit in stopped traffic for a few extra hours to allow for random searches of cars. However, I am also certain it merely will take another "foiled" plot to silence many people into gladly accepting more government mismanagement of safety. Vigilant, observant, law-abiding, gun-owning citizens defend themselves and stop crimes every day before police can respond. That is the source of real security in America: the Second Amendment right to defend oneself. The answer is for people to be empowered to protect themselves. Yet how many weapons might these checkpoints confiscate? Even when individual go through all the legal hoops of licensing and permits, the chances of harassment or outright confiscation of weapons and detention of citizens when those weapons are found at a TSA checkpoint is extremely high. Disarming the highways and filling them full of jack-booted thugs demanding to see our papers is no way to make them safer. Instead, it is a great way to expand government surveillance powers and tighten the noose around our liberties. The thing I admire about Paul is that he speaks in complete sentences and delivers well-formed thoughts. I may not agree with all of them, and some I would oppose with every fiber of my being. But there's no question in my mind that Paul loves this country, and he's honest and sincer in his efforts to represent the people. President Paul? I can't support that. But Congressman Paul, or Senator Paul? I have to admit that he'd probably get my vote. But there's no way I'd live in Texas. I like the guy, but even patriotism has its limits.